In the Preface of my book on No Excuses charter schools, I ask the rhetorical question: Would black parents of the Jim Crow era choose a modern-day No Excuses charter school if they has such a choice available. The book begins and ends with that consideration. I hope lots of black and brown parents read the book, and I hope lots of white policy elites do the same. It is interesting to speculate as to what direction education for black and brown children in the segregated South might have taken if separate schools based on race had not been declared unconstitutional by Brown v Board in 1954. Would policy elites have continued to ignore the plight of black children in the absence of the Brown ruling, or would they have tried other educational interventions besides desegregation and resource transfusions to raise achievement levels of black children stranded by generations of poverty, racism, and separation? a school that would be based on a non-negotiable philosophy and instructional model that accepted No Excuses for any shortcomings in expected behaviors, attitudes, or academic performance? a school where privileged, beginning teachers with little or no professional training would replace most of the credentialed black teachers with years of experience in working with black children? 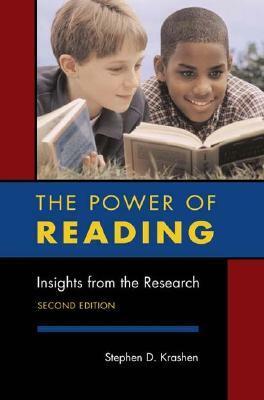 a school that focused principally on reading and math, with little interest, time, or resources expended for athletics, drama, art, libraries, vocational skills, or even textbooks? a school that required children to attend school for 10 hours a day and on Saturdays, plus 3 weeks during the summer? a school where a school uniform and even a desk to sit in would have to be earned? a school where children would be forced to be silent most of the day and made to march silently in single file from class to class? a school that would demand total compliance with instant punishment for any infraction, using methods that would include isolation, shaming, humiliation, and screaming at them? a school that would be open to white middle class children, even if none chose to attend? a school that would remain, in fact, segregated, even though the stated goal of the school would be to prepare children for college and careers in the wider world? a school that would require parents and children to sign contracts if they were to be admitted and remain enrolled, contracts that guaranteed support for rules, policies, and methods that parents would have no direct or indirect role in deciding? a school that would use public school tax dollars without public oversight to pay a non-profit corporation to run the school? 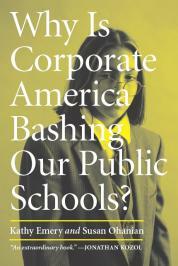 a school receiving millions of dollars in support from the largest corporations and corporate foundations in America? a school that, in fact, required children to sacrifice much their childhoods just to survive in the school? Would black parents of the Jim Crow Era choose such a new kind of school for their children, or would they, in fact, continue to prefer the run-down public schools in their neighborhoods where their children at least would be taught by professional, empathetic teachers who believe children deserve dignity and respect? Somehow I think that black parents of the 1950s would wonder how such a new “choice” could represent an educational improvement over what they were accustomed to. After all, their children in the old Jim Crow Era public schools had a curriculum that emphasized social studies and science, health and art, along with reading and math, even if their textbooks were discards from the white schools. And their children certainly were less stressed, tired, and guilt-ridden for not living up to white adult expectations and demands of the new “choice” school. Their children could, at least, remain children. I believe black parents of the 1950s would denounce such new schools, much the same way that black intellectuals, leaders, journalists, and parents, too, rejected the methods and ideology of the industrial education schools so popular among white Northern philanthropists in post Civil War era South (Anderson, 1988). In those schools of that earlier era, teaching focused on the “dignity of labor,” rudimentary academic skills, character traits, and social skills required for second class citizenship, continued racial separation, and total compliance to white economic demands. Though largely uneducated, the majority of black parents, even then, wanted the same educational rights for their children that were provided for white children of the late 19th and early 20th Century. In most cases, of course, black parents never came close that kind educational equality, but they remained insistent upon control of their schools, even if public support was meager at best. The majority of black parents and leaders rejected the spread of schools, either public or private, developed on the “industrial education model” (Anderson, 1988), as it came to be known. If black parents of the Jim Crow Era, whether in 1890 or 1950, would have rejected the alternative “choice” described above, then we may wonder how long it will take parents of this era to reject the new No Excuses schools that have all the qualities described above and that are now proliferating in the early 21st Century. When will black and white citizens, alike, demand what most former slave parents and their children asked for over a hundred years ago, which was an equal education in non-segregated schools? And why have they not done so already, when we might expect rage from parents as a suitable response to such second-class schools? Part of the answer, I believe, is attributable to a widespread hopelessness among urban parents for anything better than what is being offered as the only choice to another generation of schools characterized by malignant neglect. As Hannah Arendt (1969) noted, it is only where “there is some reason to suspect that conditions could be changed and are not [that we see] rage arise.” The absence of rage or resistance or demands for humanizing educational alternatives among urban parents may offer “the clearest sign of dehumanization” (p. 63). Another part of the answer to these questions has much to do with how little parents, children, teachers, and other citizens know about the No Excuses KIPP (Knowledge is Power Program) charter school model. Most of what they do know has been provided to them by corporate think tanks, sponsored research reports, corporate foundations, public relations and marketing specialists, charter school organizations, spokesmen for the education industry, and print and non-print mass media outlets and social media that can be counted on to report the talking points of corporate education reformers and their wealthy benefactors. This book represents a modest effort, then, to provide information that most parents and teachers, college presidents or local politicians, have not heard or read before. As such, it represents a departure from the official story of the No Excuses school model presented in Jay Mathews’ (2009a) paean to the KIPP school founders, in Work hard, be nice: How two inspired teachers created the most promising schools in America. Unlike Mathews’ Work hard, be nice…, however, this is not a book designed to celebrate the KIPP Model or KIPP’s founders, David Levin and Mike Feinberg. 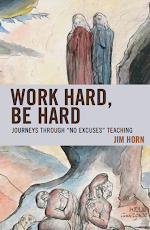 Work hard, be hard: Journeys through “no excuses” teaching is not a book that ignores or downplays the uncomfortable facts, sad ironies, and tough questions surrounding the widely-supported segregated No Excuses model for educating urban poor children in punishing, total compliance environments. My purpose in writing this book was to closely examine and interrogate the practices and ideology of the No Excuses charter schools that have become synonymous with the KIPP Model. Unlike Jay Mathews, I did not visit any KIPP schools during the years of writing this book—even though I tried. In fact, when my repeated requests to visit the KIPP schools in Memphis in 2013 and 2014 were denied, I contacted Jay, with whom I have maintained a prickly relationship over the past 10 years of writing from contrasting perspectives about corporate education issues and education reform schools. His interventions did not help, however, and his queries to KIPP’s Director of Public Affairs, Steve Mancini, brought a finalizing negative response that indicated that the content of my previous writing and speaking about KIPP had disqualified me from visiting any of KIPP’s campuses. And so it goes. The principal source materials for this book, then, are from public documents and first-person published and unpublished accounts. The book’s core is based on in-depth interviews with 25 former charter school teachers, 23 of whom are former KIPP teachers and two who are teachers from charter chains based on the KIPP No Excuses model. All the interviews were conducted between 2011 and 2014, and each was recorded and transcribed verbatim. All former KIPP teachers who contacted me wanting to share their stories were included, and all of the individual interview excerpts were selected with an eye to remaining true to the tone of the individual accounts. Because former teachers expressed anxiety or fear of potential repercussions as a result of sharing their experiences, all information has been carefully edited to eliminate the possibility of breaching anonymity. Along with some descriptive thematic groupings and some limited interpretation and contextualizing of participant accounts, I have used many direct quotes from former teachers, preferring the profundity of participant accounts to my commentary on them. Each excerpt is identifiable by a number designated by the data analysis tool, Hyperqual (Padilla, 2011), which can be linked back to individual interview transcripts. These identifying numbers have been excised from the final submitted manuscript. All original recordings have been retained. While two teachers were still teaching at KIPP when they were interviewed, all of the teachers interviewed had made already made the decision to leave KIPP. I was most interested to know what it was like inside the KIPP bubble from the perspectives of those who were no longer inside it, either psychologically or physically. The majority of participants had had some time to recover and to reflect on their experiences prior to their interviews, even though all these teachers felt working in No Excuses environments had indelibly influenced them. Seven of the 23 KIPP teachers interviewed (see Figure Prologue.1) had less than two years of experience when they began at KIPP, and five of them began teaching at KIPP without teaching experience. Seventeen of the teachers had less than five years experience. Fourteen interview participants were women, and eight were men. Nineteen were Caucasian, and three were African-American. Seven of the teachers worked at KIPP between two and four years, and eight lasted less than a year at KIPP. Seven worked between one and two years at KIPP. Five had degrees in education with professional certification. Seventeen had bachelors’ degrees, and 5 had advanced degrees. Sixteen of the teachers taught at KIPP middle schools, and four taught at KIPP high schools. Six KIPP teachers had previously taught two-year stints for Teach for America before coming to KIPP, and none had been assigned by to KIPP to fulfill a TFA commitment. Using hundreds of pages of transcribed data based on firsthand accounts of life inside No Excuses schools, the goal has been to achieve a new level of public understanding of the KIPP Model. 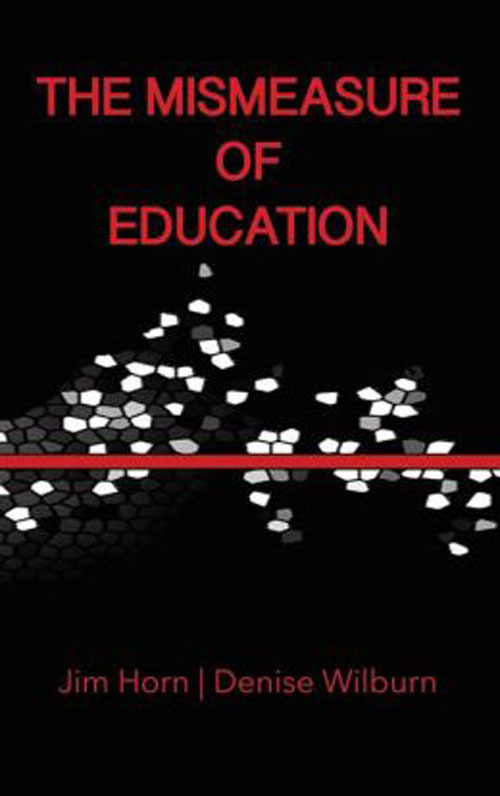 While the stories of former KIPP Model teachers provide the core of this work, the book offers, too, a brief historical perspective on previous efforts to provide paternalistic educational interventions directed toward marginalized and economically disadvantaged populations. Joining me in this effort with their own individual contributions in Chapter 3 and Chapter 9, respectively, are Scott Ellison and Barbara Veltri. Professor Ellison provides a cultural studies orientation to examining the KIPP organization as exemplifying the convergence of neoliberal politics and the assertive activities of the business and philanthropic communities. Teacher educator, Professor Barbara Veltri, examines key elements of KIPP’s sister organization, Teach for America. Professor Veltri, author of the Learning on other people’s kids: Becoming a Teach for America teacher, examines the role of Teach for America in providing the manpower and ideological complements required to counter very high levels of teacher attrition in No Excuses schools. As an antidote to the KIPP Foundation’s marketing and public relations outreach, which can be found in any number of examples from both print and nonprint media, this book offers a critical eye and raises serious questions related to public culpability for a punitive type of tax-supported segregated schooling that our dominant culture celebrates only for children who are disenfranchised by poverty and discrimination. schooling practices that, in addition to academic remediation, now focus on psychological interventions intended to alter children’s neurological schemas in order to effect changes in their emotional and socio-cultural values and behaviors. Fraught with potential for abuse by non-professionals who remain laser-focused on test performance and grades for “performance character,” these latest developments are explicated and then contrasted with other orientations and practices that acknowledge both the sociological and psychological sides of children’s experiences. In doing so, I hope to reawaken the virtues of teaching and learning within the expansive boundaries of the science and art of humane pedagogy applied to children who require the most caring, qualified, and experienced teachers. Anderson, J. (1988). The education of Blacks in the South, 1860-1935. Chapel Hill, NC: University of North Carolina Press. Arendt, H. (1969). On violence. New York: Harcourt, Brace & World. Mathews, J. (2009a). Work hard, be nice: How two inspired teachers created the most promising schools in America. New York: Algonquin Books. Socol, I. (2010, September 1). Irrepressible ed blogger beats me up, again.